Lead Poisoning is very serious and can be detrimental at any age, but most susceptible are our children. The signs and symptoms of lead poisoning in children are not always easily identifiable, and many of the signs and symptoms can be misdiagnosed, potentially leading to long term chronic exposure and more permanent adverse health effects. Three ways to potentially get poisoned by lead are ingestion, inhalation and dermal absorption (highly unlikely, unless shot by a bullet or in contact with a lead acetate). So how do you identify the signs and symptoms of lead poisoning in children? There’s primary prevention symptoms and secondary prevention symptoms. Primary prevention is the strategy of identifying sources of lead exposure before a child becomes lead poisoned. These common sources, or “lead hazards”, are the first steps toward lead poisoning and should be vigilantly monitored until such time as children have the mental capacity not to ingest toxic substances. Secondary symptoms of lead poisoning come after a child has already ingested or inhaled lead. At this point the child is already poisoned, but the sooner you can identify the symptoms of lead poisoning and seek medical treatment, the better. Primary prevention measures of lead poisoning are things to look for and address prior to an elevated blood lead level. Secondary symptoms of lead poisoning are a little too late in many occasions. The paragraphs below provide a summary of symptoms of lead poisoning based on a primary vs. secondary strategy. Age of Child (6m-6yrs of age), most susceptible, body and soft tissue of organs doing most development. Body absorption rate elevated in this age group. 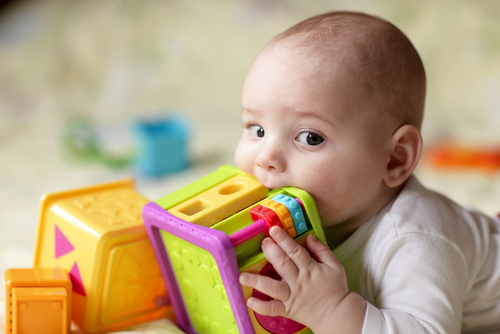 Hand to Mouth behavior of child, biting, teething, PICA putting objects into mouth. They are crawling, walking and putting everything in their mouths without being aware of potential toxic nature of lead poisoning. Age of construction of residence, school, other places we spend time. Paint condition at places we spend time. If flaking, cracking, chipping, chalking or blistering and leaded paint, this would be a clear primary symptom of lead poisoning. Obvious signs of Friction or Impact on painted surfaces Hobbies and Employment that might bring lead into the home; painting, stain glass windows, fishing, hunting, printing inks, pistol ranges, welders, contractors, auto, mechanics, …. The signs and symptoms of lead poisoning in children listed in the tables above is well documented via the Mayo clinic at (http://www.mayoclinic.org/diseases-conditions/lead-poisoning/basics/symptoms/CON-20035487) as well as the Agency for Toxic Substances and Disease Register (http://www.atsdr.cdc.gov/csem/csem.asp?csem=7&po=10). The solution? Be vigilant and keep eye on your child. Look at paint condition and signs of paint deterioration where you and your child live, work and play. When you suspect primary signs and symptoms of lead poisoning, be proactive and properly address. If you are not sure if areas in question are a lead paint or lead hazard, get it tested by a professional lead risk assessor or inspector or do it yourself with, “The Environmental Professional In-A-Box,tm“ available at www.certifiedkit.com. If it’s not lead paint, then it does not have one of the key elements of symptoms of lead poisoning primary prevention strategy. If it is lead paint and in a deteriorated condition, then there is a clear symptom of lead poisoning. If you notice any of the secondary symptoms of lead poisoning consult a physician promptly and request a venial blood lead test.